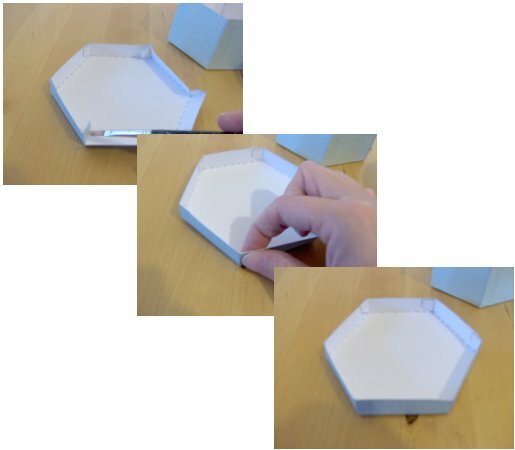 The hexagon box measures 11cm x 5½ cm, it is an unusual box shape that looks very impressive but is easy to do. 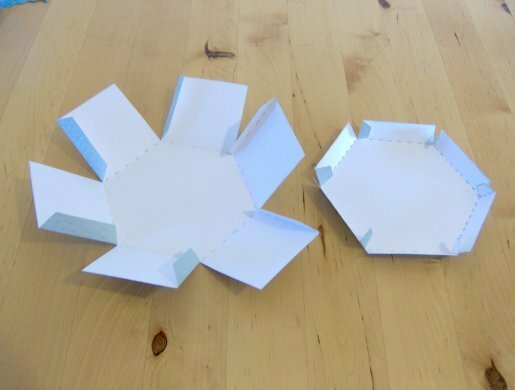 It also has a separate lid, so the box and lid can be made out of two different coloured cards if you like and they can be decorated to compliment or contrast with each other. The combinations are endless, have fun making them. 1. 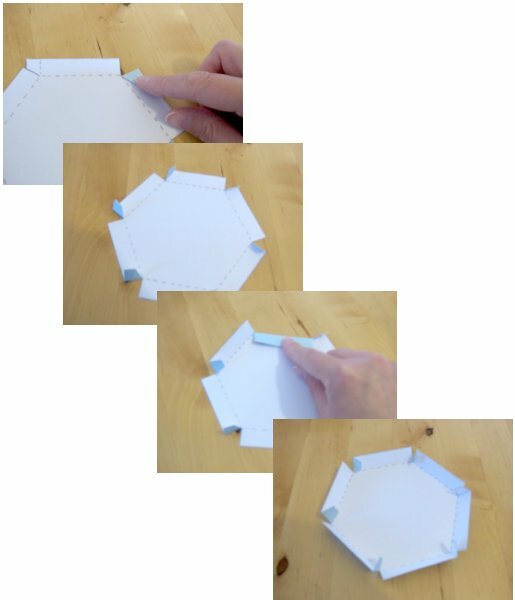 Download the templates onto the back of the pieces of card. 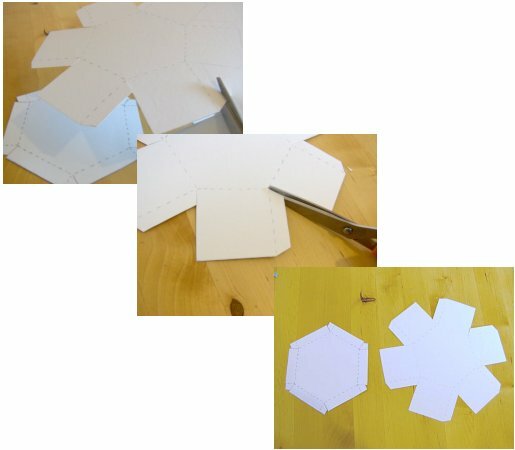 If your printer has trouble printing onto card, then print the templates onto printer paper, cut them out and draw around them onto the back of the card, referring to the printout for where the fold lines and cut lines are. (The cut lines are solid , the fold lines are dotted.) 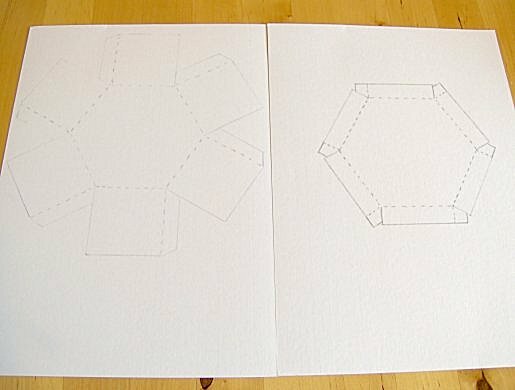 There are two sets of templates - the second set have no dotted lines on them; this makes them look more professional when they're made, as the inside of the box will be plain, without dotted lines on it. But be careful, as they will be harder to make! 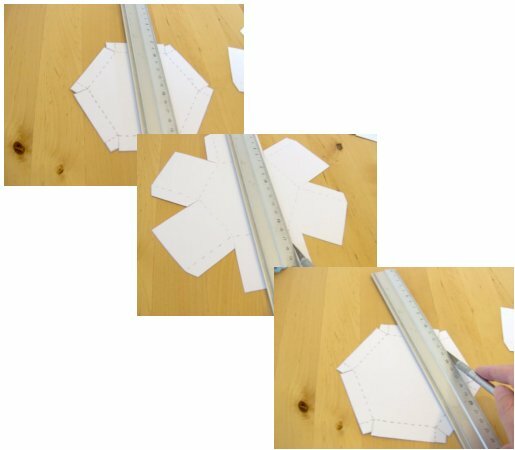 There's a small guide picture showing the dotted fold lines on each template to help you. 2. 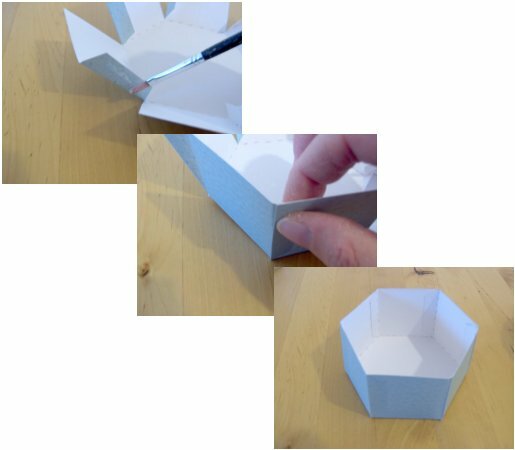 The box and lid are made in the same way so these instructions are for both pieces. Cut out the templates following the solid lines. 3. 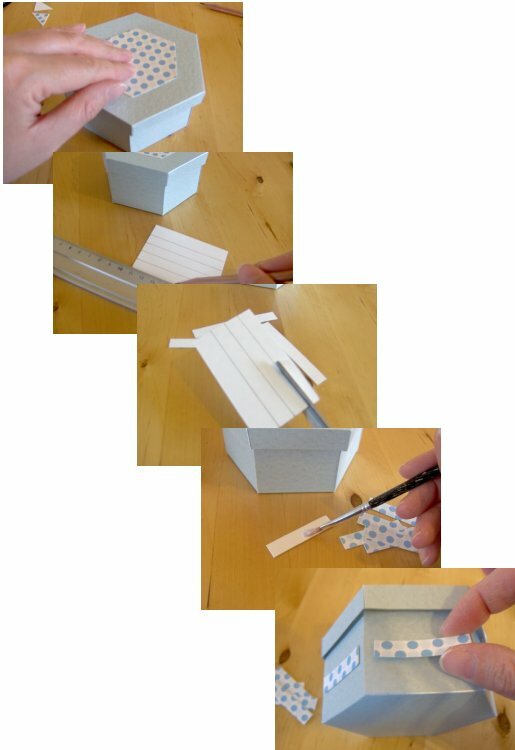 Score along the dotted fold lines using a bone folder and ruler or very gently using a craft knife and ruler (remember not to cut through the card, it is just to help it fold). 4. 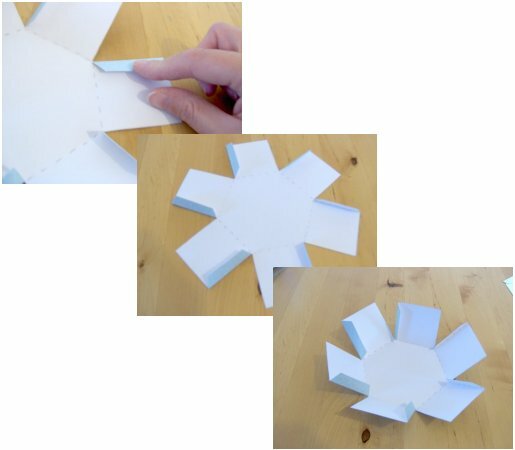 Fold over the sides and tabs and press with your finger. 5. 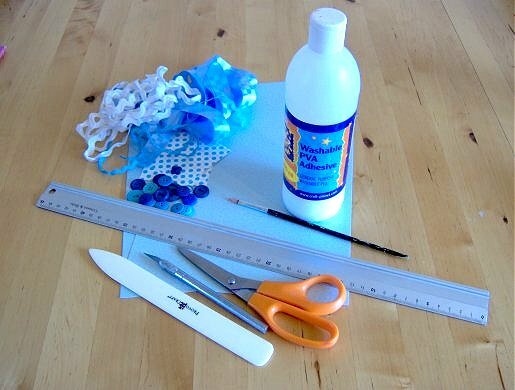 Check which side of the tabs will need gluing and spread on PVA glue. Press them into position and hold for a couple of seconds while the glue sets. Remember the tabs should be on the inside of the box! 6. 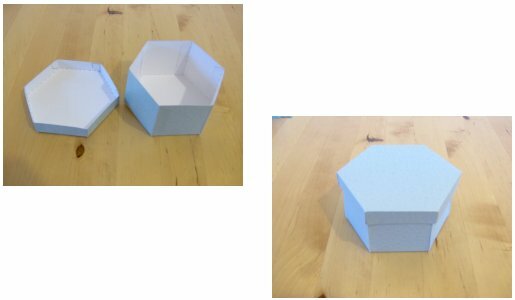 The box and lid are now ready for decorating. 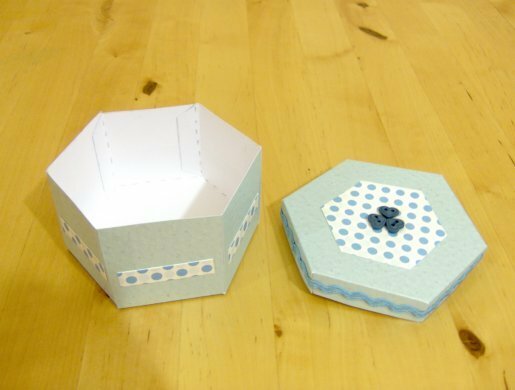 I cut a hexagon shape out of dotty card and stuck it to the top of the lid with PVA glue, I then cut strips of the same card and stuck them around the sides of the box. 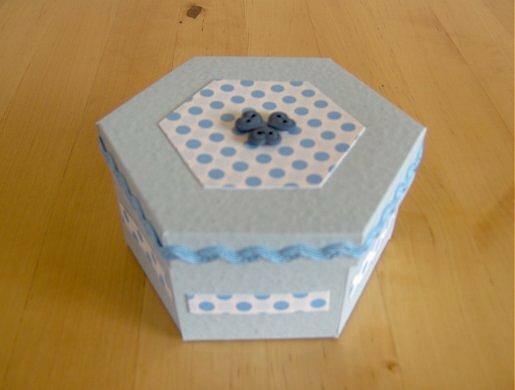 Next I glued some blue rick-rack braid around the lid edge and finished off gluing three heart shaped buttons to the centre of the lid.